We’d love your help. 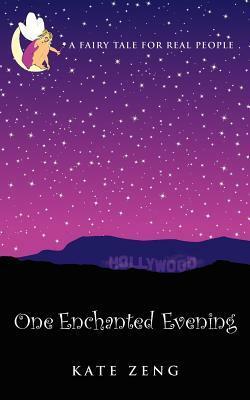 Let us know what’s wrong with this preview of One Enchanted Evening by Kate Zeng. To ask other readers questions about One Enchanted Evening, please sign up. This book started off with so much promise. It starts off with the main character I (I don't think we ever learn her name) having a hum drum day and then she discovers a huge bag of money! Unlike a typical chick lit book, she spends about $2000 on frivolous things and then feels bad about it. She the I received this book through the GoodReads First Reads giveaway program. Disclosure: I received a free copy courtesy of the author, via GoodReads First Reads. Also, I hate spoilers of any type and usually try to avoid them, so this review maybe vague. That's how I role. Deal with it. So, I read this book over the course of a period of time where I was working an irrational amount of hours in a small time. I work in theater so my hours can be really weird like that depending on the week, and this was a perfect book for that. Fairy tales, as I think of it, are supposed t Disclosure: I received a free copy courtesy of the author, via GoodReads First Reads. Also, I hate spoilers of any type and usually try to avoid them, so this review maybe vague. That's how I role. Deal with it. Fairy tales, as I think of it, are supposed to be a rebirth of sorts from the ashes of just an awful existence, and this is a modern take on that. Modern? Contemporary? Not sure how I'd put it, but this is the sort of thing that happens today. Living paycheck to paycheck and surrounded by people who are just, not awful but somewhat close. Anyway, fairy tales are reality aren't necessary compatible. Like, I would love to find a purse full of cash like the main character did, but that's not exactly a good thing. Kate Zeng didn't dance around that. Points for that! A forty-ish year old single mother of a son (Adam), lives in Hollywood barely making ends meet. She finds a Prada bag one evening after working late as an accountant, and decides its her time to make some changes in life. Most of the changes are things that she's had in mind for a long while, but never had the means to do anything about. So, the whole story revolves around her finding this large sum of money and how it can improve her life, as well as her sons. A few things that were a bit odd: A forty-ish year old single mother of a son (Adam), lives in Hollywood barely making ends meet. She finds a Prada bag one evening after working late as an accountant, and decides its her time to make some changes in life. Most of the changes are things that she's had in mind for a long while, but never had the means to do anything about. So, the whole story revolves around her finding this large sum of money and how it can improve her life, as well as her sons. A few things that were a bit odd: first, that we never learn her name throughout the entire story; second, I felt as though I were either inside someone's head or reading a private diary. Overall, I felt it was an average plot but not spectacular or one that I'd remember long after reading it. The plot is good and the author kept my attention. The conversations between characters, however, needed some shoring up. It got pretty dicey with who was actually talking some of the time. The main character is supposedly dramatic, according to her and the other characters, but is static through and through. She is the same person at the end of the book as she was at the beginning. Her actions and thoughts of herself never did match up. The one character I liked, and wanted to play a bigger role The plot is good and the author kept my attention. The conversations between characters, however, needed some shoring up. It got pretty dicey with who was actually talking some of the time. Despite numerous difficulties with the editing (most notable being dropped words) the development of the main character as she undergoes a life-changing moment is engaging. I hope the author's next work receives better editing.